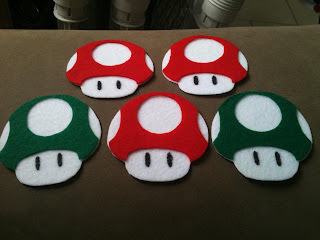 The Unknown, Entertaining Mind of Miss Dena Jones: Super Mario Mushrooms!!! Hi, everyone! As I mentioned previously, my baby turned one this past Saturday, and we threw a birthday party for her. We went with a superhero theme. 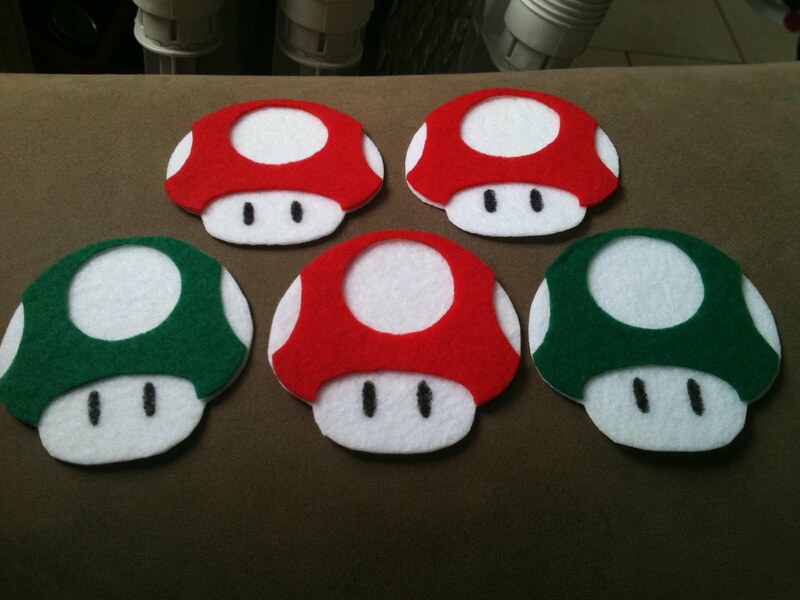 I'll be posting tons of pics later, but for now, I wanted to share some felt mushrooms I made for my nephew to put on his cape for the party. My nephew is almost three years old and loves Super Mario! While Super Mario isn't exactly a superhero, I knew that my nephew would love to decorate his cape with something from the videogame. While searching the internet for a digital cut file, I came across this Super Mario Mushroom SVG file. I used the MTC software and a cut file I downloaded here. I first cut a mushroom with my Cricut and then traced the images on felt to be handcut after. If you look closely, each mushroom consists of only two pieces. The base was pretty easy to cut. The top piece wasn't so bad. If I remember correctly, these mushrooms are about 3 inches high. For the eyes, instead of cutting and gluing those small pieces, I used the negative as a stencil and colored in the eyes with a black Sharpie pen. Easy peasy! My nephew lined up all five mushrooms -- or "toads" as he called them -- at the bottom of his cape. It was so cute, and I wish I had taken a picture! Darn! He did LOVE his cape, though!!! Anyway, if you have a son or daughter that is in to Super Mario, he or she will probably love these. I'm thinking of even using them on cards. They are just too cute! Thanks for looking and have a great Friday! Those are adorable! Love Mario! How cute and what a great idea! I love using felt! these are 'super' cute! they would be great for other applications too, a walk in the woods when you found a good crop of mushrooms, etc. These are so cute! How much fun to have a one year old, that was a long time ago for me. Thanks so much for stopping by my blog and leaving a comment!